THE DEPARTMENT OF ROCK is a secret organization that monitors, supports, and defends your right to party. This organization was created under a presidential directive to police and monitor all partying rights. The Department of Rock’s ultimate mission is to protect and defend the nation from sub-standard rock. The Department of Rock will not rest until they have reshaped the world in their own image. The Department of Rock is the ultimate Album Oriented Rock tribute band which none can compare. It's a non-stop bonanza of hits from numerous AOR male and female artist. 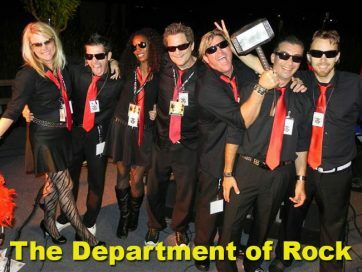 The Department of Rock will make your event legendary and remembered as the party event of the year. No fakers, only real musicians performing rock the way it was truly intended. The Department of Rock performs LIVE MUSIC and uses no performance backing tracks. Our performers sing like the original artist, our musicians play like the original artist, everything is live without a net. There is only one way to rock. There is only one Department of Rock! When your party needs to rock, we’ll be there! When your party needs to roll, we’ll be there! When your party needs defending, we’ll be there! We are The Department of Rock. The Department of Rock performs the hits of the past and current rock & pop dance hits and so much more. By day, these seven agents run The Department of Rock. By night, they defend your right to party with extraordinary abilities, you will rock out hard to the best Rock & Pop Dance music of the 70’s, 80’s, 90’s, and today by everybody's favorite Top Artists! THE DEPARTMENT OF ROCK is always working towards bringing you the VERY best and MOST amazing songs and performance. We are defending your right to party. Stay tuned for the hits, spread the word, and join the force!